What’s that about? Luke doesn’t tell us why she went or what she was looking for but maybe we can get a clearer picture of what’s going on if we put today’s gospel (Luke 1:39-45) in a larger context. The angel Gabriel has just told Mary that she has been chosen and favored by God, that God is with her, that the Holy Spirit will come upon her and the power of the Most High will overshadow her, that she will conceive and give birth to a son, the Son of God, and she will name him Jesus. As soon as Gabriel makes his announcement and departs, so does Mary, with haste. She wastes no time. She hits the road and heads for the hills as they say. Maybe she’s excited and wants to share this good news. Maybe she wants to celebrate what is happening in her. Or maybe she’s afraid and needs a friendly face. Maybe she’s overwhelmed and needs someone to talk with. Maybe she doesn’t know what to do next and is looking for some guidance. Maybe she wants help in figuring out how to tell and deal with Joseph and her mom and dad. Maybe she just wants to get away for a little while and try to make sense of what has happened. Maybe she wants to talk with someone who will understand. Maybe it’s any one of those things, all of them, or a thousand other things that caused Mary to leave with haste. Whatever Mary’s reasons were, you and I probably know what that’s like. Haven’t there been times in your life when you set out in haste looking for something or someone familiar to stand with you in the midst of the unexpected and unfamiliar? Who has been your Elizabeth? When have you been Elizabeth for another? Maybe it was that first day, first week, first year of being a married person, a divorced person, a parent, a widow, and you didn’t know what to do but you knew you had to make room in your life for this new person you were becoming. Maybe it was a time that you did or said something that hurt another and you knew that wasn’t really who you are or who you want to be and you felt estranged not only from the other person but from yourself. A friend of mine took a new job nearly two years ago. He recently said to me, “I’m just now starting to feel like myself again.” Anyone who has lost a loved one knows that feeling of being an alien in his or her own life. I remember a woman asking me if she was still a mother after her daughter died. I remember looking at myself in a mirror shortly after my ordination and seeing a stranger in a clergy shirt looking back at me and wondering, “Who is that guy and who am I?” Maybe someone offered you an opportunity that you had never before considered possible. They saw something in you, a gift, a capability, a possibility, that you had never seen or imagined for yourself, and that person they saw was a stranger to you. At some time or anther we’ve all felt like strangers to ourselves. When have you felt like a stranger to yourself? What was going on? When has life left you feeling uncomfortable in your own skin? An alien to your own life? I wonder if that’s exactly how Mary feels. I wonder if her leaving in haste is the outer expression of her inner estrangement. I wonder if her leaving home reflects that she is not yet at home in herself. I don’t think Mary is running away from home, her life, or herself. I think she leaves home so she can return, and she knows that Elizabeth is the one who can help her come back to her home, her life, herself. 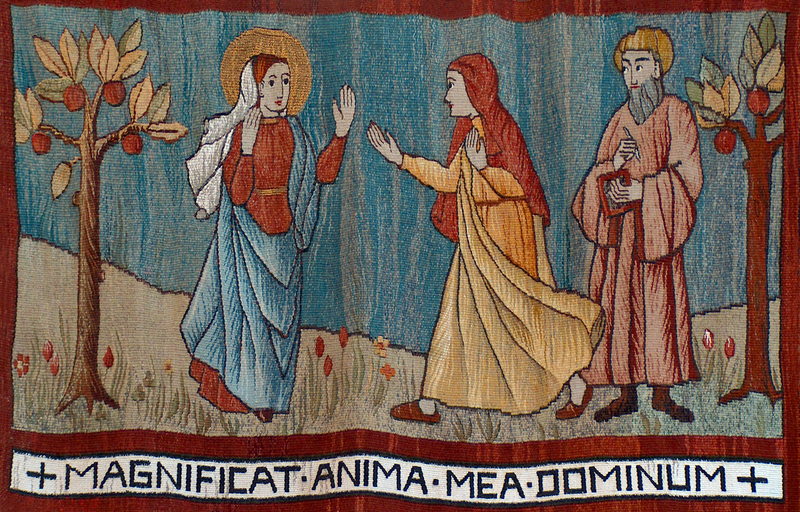 Mary doesn’t go to Anna her mother, to Joseph her fiancé, to the local clergy, or to a girlfriend around the corner. Not just anyone can handle or be trusted with our estrangement. Elizabeth is Mary’s go to person; Elizabeth her older cousin, who is getting on in years, “who was said to be barren,” and who is now six months pregnant, just as Gabriel had said would happen. The trip to Elizabeth’s house isn’t a simple walk across the street or around the block. Our sacred tradition says that Zechariah and Elizabeth lived in Ein Karem, a town just outside of Jerusalem and about 80 miles from Mary’s home in Nazareth. Eighty miles; that’s about thirty hours of walking. Mary was surely looking for something in particular from Elizabeth. I don’t know what she wanted or needed but I know when I’ve been estranged from myself I want a place of acceptance and understanding, I want someone who will love me and not judge, someone who will be with me in the beauty, pain, and mystery of what is happening, someone who will encourage and offer hope without telling me what to do, someone who can be present to my reality and speak truth even if it hurts, someone who assures me that I don’t have to do this alone, someone who offers her or his faith, hope, and love when mine is in short supply, someone who will remind me that I am ok and I can do this. Isn’t that what you want when you feel like a stranger to yourself? Isn’t that what you needed from your go to person, from your Elizabeth? What I am really describing here is hospitality. Hospitality is the antidote to our estrangement. I am talking about the kind of hospitality we receive from another that allows us to be hospitable to and accepting of ourselves. The hospitality Elizabeth offered Mary was more than an open door, a warm welcome, and a place to stay. It was an affirmation of Mary’s life. It was a prayer commending Mary to God. It was a blessing that gave Mary back to herself. “Blessed, blessed, blessed,” says Elizabeth. Her words of affirmation, commendation, and blessing will remain with Mary the rest of her life. They will echo in the silence as Mary ponders and treasures the words of the shepherds at Jesus’ birth. They will ring in her ears when Simeon declares that a sword will pierce her own soul. They will call her back to herself when her twelve year old son runs away to be in his Father’s house. They will hold her broken heart at the cross. And they will sing with joy at the empty tomb. That’s how deep and authentic hospitality works. It’s not just a word spoken or an action done at a particular point in time. It’s an event that stays with us and continues to affirm, commend and bless. It’s an event in which we recognize God’s presence and leap for joy. It’s an event that is pregnant with possibilities and new life. I wonder in what ways you’ve experienced this Elizabethan hospitality. When has another, an Elizabeth, affirmed, commended, and blessed your life? How is that event of hospitality alive in you today? What is gestating in you and waiting to be born? I love what you say here! But also, I am sure that the threat of being stoned to death for carrying a child before being married was one of the legitimate worries Mary carried with her on those 30 hours of walking to Elizabeth’s home. She knew the scriptures, and in my belief, she might have been willing to put her life at risk from rapists and robbers on the road, rather than stay home and be killed by the pious elders in her own town. It was a prudent thing, to go somewhere where she was less known, and not likely to be the target for the condemnation which was so likely all around her. Thank you for this reminder that he practical and the spiritual are never far apart. I hope you are having a blessed Christmas and that the new year is abundant with love and joy. Thanks for the acknowledgement. I am not a fan of horror novels and vampire stories, so I had never read Anne Rice until her trilogy about Jesus. The story in book 2 of the young boys being stoned to death at the beginning of the book, for an innocent friendship which the community construed as homosexual, was eye-opening to me. Also, I read a book about a Princess in Saudi Arabia, and how her cousin was shut up in a tower and starved to death, as a way to silence her and protect the “honor” of the family. I just read a story in the New Yorker from 11/17/17 called “Are you happy?” in which an Indian immigrant woman is an unregenerate alcoholic, and her son is telling the story. The father finally sends her home to India to be conveniently murdered. The byline at the end of the story is that this man cares about alcoholism and honor killings in India. The underpinning deterrents of social mores are these hidden disappearances and murders, and the power to have them be successful. When I was in the Peace Corps in South America, many servant girls were sent back to the country when they became pregnant, due to the men in the family having access to them. A friend who was in the Peace Corps in Yemen in 1980 watched the town stone to death a young woman who she had just diagnosed as pregnant. Her father and brothers picked up the first big stones to throw at her. Who got her pregnant, in a house in which no neighbors had access to her?? To read the Scriptures from the viewpoint of women is an invitation to consider all these things. Thanks for the very wonderful sermons you have written. Yes, Martina, we need to hear the perspective and experiences of women. Too often those voices are silenced or ignored and I am grateful for your voice. Mary certainly must have had experiences and fears that are not brought out in our scriptures. Thank you.